Hi guys, Briohny here from Accelerate Auto Electrics and Air Conditioning on the Sunshine Coast. Today we’re gonna run you through a quick job spotlight, a custom, in-cab Mazda BT50 Lead Crystal® Dual Battery System. This is one that we’ve put one in today and we’ll just show you in a little bit more detail, exactly what we’ve done. So we’ll start up the front of the car. So just behind the battery here under bonnet we’ve got a 250 amp midi fuse holder. It’s got a 50 amp midi fuse down here as well. We’ve got a REDARC BCDC that goes behind the seat. It’s a 1240D, and so that needs 50 amp midi fuse. So we then run an 8 B&S cable. Now that goes basically from the battery here and it runs up the engine bay and it runs down along inside the car and along the kick panel trim. It’s all hidden under there, and then it goes under the carpet in a void, and up behind the rear of the seat to where the battery is. We’ll take you down the back and have a look at the other stuff that’s in the car. This is the custom alloy slimline bracket that we’ve had made. Also the 100 A/hr Slimline Lead Crystal Battery. What happens is your battery sits in the bracket and this is fitted behind the seat of the car. We’ve had the bracket made so that we can bolt it in so it’s all secure. It has a mount for the REDAC BCDC, the 1240D. We’ve gone for the 1240D over the 1225 because the Lead Crystal Battery likes to be charged at about 30%. With 108 Amp hour battery, it needs like a minimum of 30 Amp hour’s going into it. We also have some tie down straps. And then in here, we’ve got a 6-way fuse box, this allows us to run six different circuits out of here, and we can run them to wherever you need in the vehicle. In this particular one, we’ve got them in the rear which we’ll show you in a second. And we’ve also got two Anderson plugs here, so our standard one comes with a solar input and them this has been charged from the battery. For this particular vehicle, this one is already mounted in the car, but you’ve got two grey Anderson plugs and we actually have a solar output in the rear of the vehicle. This customer has requested that all of his power outlets be mounted in the rear of the car. They can be mounted wherever you want. Typically in utes, people put their fridges and everything in the back here, so that’s where they like them. You can have any combination of outlets. This one has gone for a dual USB port. A voltmeter that’s reading the dual battery. It’s got two cigarette sockets. It’s also got two Anderson plugs. The red one here is to input your solar into. Whether you have got a blanket, you’ve got a portable one or you could even put a fixed panel mounted one on the roof, that’s your solar input option. And then you’ve also got an Anderson plug option, so you might be running a compressor, I don’t know, whatever you’ve got with an Anderson plug on it. These mounts, or power outlets, can be mounted anywhere in the vehicle that you want to. These are all fused individually, so the Anderson plugs are each running a 6 mm cable, coming from the fuse box. The cigarette sockets have got a 5 mm cable each, and then there’s a fifth cable coming for the USB and the voltmeter. In the rear of the car, we’ve now mounted the bracket, the battery, we’ve connected up all the cables. Now to get these in here we also had to move the jack mount and the tool bag mount. We actually pull the carpet back, cut them out, remount them and then bog and repaint it all in there, so there’s not gonna get any rust or anything like that. This is pretty much all ready now to get rear seat back in and give back to the customer. If you’d like a custom Lead Crystal® Dual Battery System in your dual cab, you can give us a call on 1300 227 353, comment below, or contact us online. If you are looking for a little more safety and peace of mind when you’re on the road travelling, we recommend installing a Rear Vision Camera for towing. The more visibility you have whilst reversing and driving, especially when towing a caravan or trailer, the safer it is for you, your passengers and other road users. This is why we recommend rear vision cameras for anyone that is looking to tow a caravan, camper trailer, horse float or any other trailer with their vehicle. Rear vision or reversing cameras are becoming more common as a standard feature in modern vehicles. In fact, America has just recently introduced legislation to make reversing cameras a mandatory safety feature in all new vehicles. When towing in particular, we recommend setting up dual rear vision camera’s. One on the rear of the car. This is great to use when you are hooking up the caravan or trailer as it allows you to see the tow ball/hitch. We recommend a second (dual) camera installed on the back of your caravan. IMPORTANT NOTE ON DRIVER AWARENESS: It is possible for drivers to become over-reliant on reverse technology. while technology will greatly improve reversing and road safety, it should not replace active supervision! Now that you have your caravan hooked up, the total length of vehicle and caravan is usually more than double the vehicle. Which means you now have bigger blind spots. With a rear vision camera fitted to your caravan, you can leave the camera on while driving. This majorly improves visibility when merging or overtaking, very useful for highway driving! 2. Assistance for tight manoeuvring. If you have recently purchased a caravan and don’t have much experience towing or manoeuvring, here are some quick tips for reversing. If you are moving at a slower pace, you will have more time to make minor steering adjustments before you get yourself in an undesirable situation. Patience is critical, especially if you are new to the whole experience. Use your left and right mirrors to monitor the rear corners of the trailer, this will give you an indication of any trailer change in direction. If you see too much of the trailer on one side, turn the wheel towards that mirror to straighten up. Move your hands from the top of the steering wheel to the bottom. Moving your hands to the left will now move the caravan to the left and vice versa. Once you have established the right amount of turn, straighten up to the point where the vehicle follows the caravan on the same arc. If you end up in a jackknife position, there are a few things to do to get out of it. Stop immediately before you cause any damage. Turn the steering full lock away from the angle of the jackknife. Move forward slowly and this will straight the combination very quickly. When reverse parking, take it slow and if you can, set up markers to simplify your parking. Remove your Weight Distribution Bars prior to reversing into the parking bay. Identify any hazards in or around your site. Take it slowly and use a spotter (or rear vision camera) to stop you from hitting anything or cause damage. The specialised team at Accelerate Auto Electrics are more than happy to assist with any inquiries that you may have regarding Rear Vision cameras for towing your caravan or camper trailer. Get in touch with us on 07 5479 6652 or contact us here! Does your car feel like it’s not performing as well as it used to? Maybe you’ve noticed a reduction in power or the car is blowing a lot of smoke out the exhaust. If you have identified an issue with your car’s performance, it may benefit from a BG Engine Clean. What is a BG Engine Clean? In a nutshell, a BG Engine Clean safely and effectively removes carbon deposits from internal engine components. Over time vehicle engines accumulate gums, varnishes and other build-up caused by oil, pollutants and outside debris. These deposits can impede normal piston-ring function; reducing fuel economy, lowering power output, and increasing exhaust emissions and oil consumption. A BG Engine Clean restores power and performance to your vehicle by removing these accumulated deposits that form in the various critical engine parts. There is a wide range of cleaners in the BG range that allows for customised solutions depending on the vehicle type (Diesel or Petrol) and issues that are occurring with the engine. What are the signs your car is in need of a BG Engine Clean? There are a few common signs that could indicate that your car’s engine is in need of a clean. The vehicle could be hard to start. If you have noticed any, or all, of the symptoms that are mentioned above, it is recommended to take your vehicle to your automotive repairer or mechanic for an engine clean. Your repairer will be able to suggest the BG Clean that is best suited to your vehicle and needs. Here at Accelerate Auto Electrics, we specialise in solutions to suit all makes and models of vehicles. If you have any further questions about BG Engine Clean or improving your vehicle’s performance, give us a call on 1300 227 353, email us at [email protected] or contact us online. Want to improve the performance of your Diesel 4WD? Hi guys, Briohny here from Accelerate Auto Electrics and Air Conditioning on the Sunshine Coast. Quite often we get asked what the difference is between the brands and models of electronic brake controllers that are on the market. Today we’re going to run through a few of the entry-level brake controller options. The Tekonsha Voyager may not be the fanciest brake controller in the Tekonsha line up but it is one of the most affordable and effective. Like other electronic brake controllers, the Tekonsha Voyager trailer brake controller senses when you start stopping and applies a steadily increasing amount of the force to the trailer’s brakes. It is proportional and as such must be mounted horizontally but can be tilted vertically. The best thing about the Voyager is the price. It is Tekonsha’s most affordable brake controller. It is equipped with a colour-changing LED that goes from green to red as the braking force grows. It will do up to four axles, the Voyager is super easy to use and comes with the brackets you need for fitting. I can tell you how many of these I’ve seen in vehicles over the years. Even though they are Tekonsha’s base model, in my experience they certainly are a quality unit. No frills and not the smoothest, but it won’t let you down. Now let’s take a look at the Hayman Reese Sentinel. Again, the unit is nothing fancy but it is a no-fuss option for an effective electronic brake controller. Its simple operation, slim design and a wide range of mounting options make it the perfect choice for today’s towing vehicles. Since the Sentinel has no moving parts or pendulums to adjust, it can be mounted in virtually any position. It comes with the mounting brackets and hardware. It’s a bit slimmer than the Voyager so in some applications, you might find it easier to mount. The Sentinel is a solid state brake controller. Because of this, it has no moving parts. What this means is that it is not proportional like the Voyager. Instead, it has an output thumb wheel on the top of it for the driver to adjust according to the conditions. Both of these guys have been around for years and anyone who works on cars will tell you they’ve seen heaps of them and all with happy owners. Personally, I’d go the Voyager because of its proportioning capabilities but if you are looking for a budget controller that will probably outlast the car it’s in, then you can’t go wrong with either of them. Although these entry-level electronic brake controllers are good for those on a budget, we always recommend the Redarc TowPro Elite. Confused about what trailer plugs you need? Our simple explanation explains all. 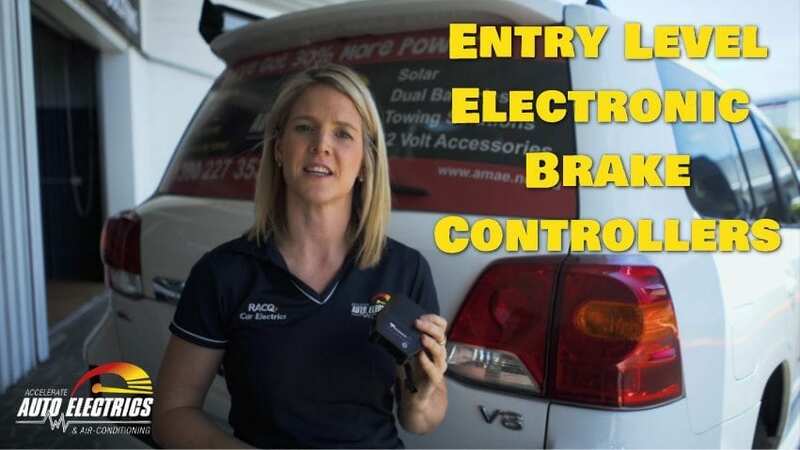 Hi, I’m Briohny from Accelerate Auto Electrics & Air Conditioning on the Sunshine Coast. Some of the most common questions we get asked as auto electricians are, what the different types of trailer plugs are, and what each one is used for. Today we’re gonna take a look at the most common options for trailer plugs, the five pin, seven pin, twelve pin, and also the Anderson plug. 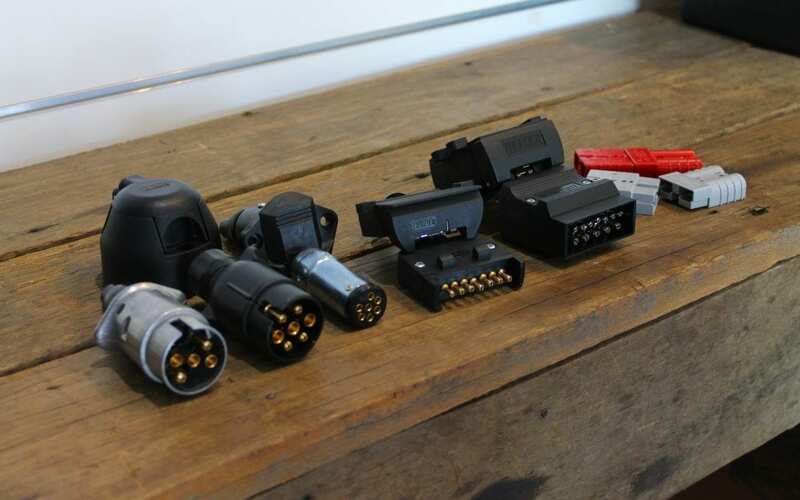 They’re called five, seven, and twelve pin plugs because they connect five, seven, or twelve wires on your car to your caravan or trailer. So, if you turn the indicator on in your car, the first pin connects the signal in the car to the trailer indicator and makes the trailer indicator work. So let’s take a look at each plug. First up we have the five pin, which only comes in the round. In Andrew’s twenty years of being an auto electrician on the Sunshine Coast, he hasn’t actually ever seen one of these. They are definitely the least common, but they do connect very basic things. They connect the left-hand indicator, the right-hand indicator, a return to earth, your brake lights, and your taillights, including clearance and sidelights. Next up is the seven pin trailer plug, which comes in flat or round. In the round, you can get a big size, or a small size. Usually the big is used on trucks or heavy machinery. These vehicles have a lot more lights and require more power to be fed through the plug. The seven pin connects all of the things that we mention with the five pin, plus reverse lights, and an electronic brake controller. We prefer using the flat over the round because in our experience, the wiring is more likely to get damaged in the round. Also, you can plug a seven pin flat into a twelve pin flat, making it more versatile. On the tow vehicle, our preference is to mount a twelve pin flat. If you tow a trailer or caravan that has either a seven pin flat or twelve pin flat, both of these can plug into the twelve pin on your car. A fridge ignition feed to power the fridge in your caravan or trailer while you’re driving. A breakaway battery monitor. This allows the voltage of the battery on your breakaway unit to be displayed on the dash of your vehicle. ESC, which is Electronic Stability Control, if your caravan has it. Or a heavy earth return. Each caravan and trailer manufacturer wires up their plugs differently. We always request a wiring diagram from the caravan or trailer manufacturer to confirm what needs to be wired to what pin. Lastly, we have the Anderson plugs. The Anderson plug is most commonly used to charge the batteries in your trailer or caravan when you are driving. You can do this via a twelve pin plug, but we don’t recommend it. The power that is fed into the plug to charge the batteries is generally more than a twelve pin plug can handle. We regularly see melted twelve pin plugs when people charge the batteries via them. You can get the Anderson plugs in grey, red, or blue. Each coloured plug does not physically fit into the other colour, so you use a different colour to ensure that you plug them into the right device. When it comes to getting your vehicle wired up to tow a trailer or caravan, there are few things we recommend. If you plan to tow a caravan, we usually suggest getting an Anderson plug installed, especially if you want to charge your caravan’s battery from your vehicle. Twelve pin trailer plugs are not designed to hold a charge feed and will usually melt when exposed to that much current.